If you have a stain on your carpet, rug, or clothing, you might be trying to use a store-bought product to remove the stain. Not only are these not always the most effective method, but they often contain harsh ingredients you might not want on your body or in your home. A better option is to turn to natural stain removers, such as those listed here. Natural stain removers as described above contain ingredients that are less harsh to your fabrics. However that’s not the only benefit to using a natural stain remover. You’ll be improving your carbon footprint by using ingredients that come directly from the environment. You’ll also lessen the chance of hurting a pet or young child if they come in direct contact with these stain removers. Of course, caution must still be taken into consideration when using these. 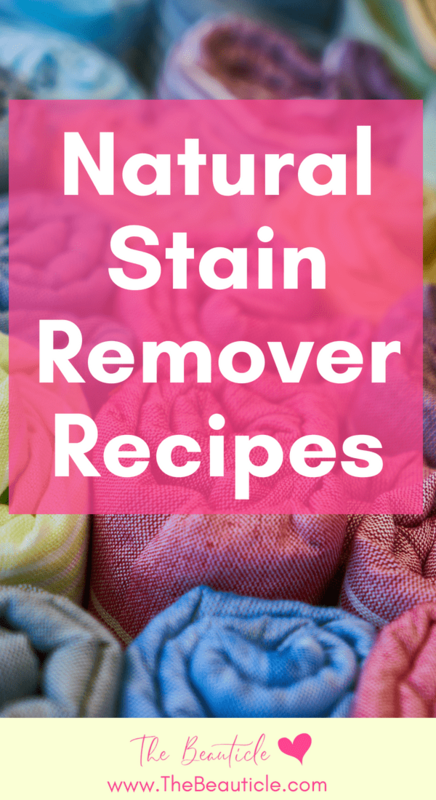 This first natural stain remover only contains a few simple ingredients in order to help you get rid of stains in clothing or other fabrics without using any harsh ingredients. You can put the finished mixture in a spray bottle and keep it in your laundry room. Spray stains before putting clothes or linens in the washer, and it should work great. For the simplest recipe, you just need some natural soap, such as Dr. Bronners Sal Suds, water, and coconut oil, plus a spray bottle. Combine the ingredients in the bottle, then spray it on the stains before washing. Extra virgin coconut oil helps to lift stains from fabric naturally. When you are putting together your very own natural stain remover, make sure you are careful about it and that you don’t test it on a large piece of fabric or clothing. Test it on something like a towel or washrag first to make sure it doesn’t change the color of the material or cause other bad reactions. Once you have made your natural stain remover with coconut oil and other natural ingredients, make sure you never rub the stain. Whether it is in carpet, your clothing, or linens, blotting should always be done. If you catch the stain following a spill when it is wet, blot it dry with paper towels first. You can then spray the stain and blot it once more. The only exception is when it is on clothing you are about to put in the washer. You can apply the stain remover, let it sit for a few minutes, then put it in the washer. Have you ever tried using coconut oil as a stain remover? What were your results? Leave your comments below.